Home / Columnists/ Does GSP decide the progress of Sri Lanka? Does GSP decide the progress of Sri Lanka? In March 2017, the European Union (EU) approved the grant of GSP Plus facility, a much-awaited response by the Sri Lanka Government since it had been temporarily suspended. This decision of the EU created a blissful environment in Sri Lanka. But in the latter part of December 2017, the United States had declared the grant of GSP benefits for Sri Lanka and another 120 nations would end on 31 December 2017. Now the time is ripe for Sri Lanka to examine how new global tendencies like fluctuations and changes in GSP facilities are liable to affect Sri Lankan exports. In the early 1960s, the main dialogue in international trade arena was to remove trade barriers and open avenues of opportunity for developing and least developed countries for entry into trade with developed countries. The offer of tariff preferences by developed nations to developing countries and least developed countries as the best gateway to have trade relationship with developed countries was proposed by the United Nations Conference on Trade and Development (UNCTAD). The Generalised System of Preferences or GSP System was introduced in 1968 by the General Agreement on Tariffs and Trade (GATT) on its initiative to encourage industrialised countries or developed countries to grant Autonomous Trade Preferences to all developing countries in accordance with the recommendation of UNCTAD. From the early 1970s, developed countries or industrialised countries such as the European Union (1971), Japan (1971), Norway (1971), Switzerland (1971), New Zealand (1972), Australia (1972), United States of America (1974), Belarus (1992), Russian Federation (1992) and Iceland (2002) implemented their Generalised System of Preferences or GSP system in offering trade preferences to developing and least developed countries. Developing countries and least developed countries recognised as beneficiary countries are offered preferential tariff reductions for their export products to developed countries under the GSP system. It is a removal of partial or entire tariff charges for goods exported by beneficiary countries. In 2005 EU introduced special incentive arrangements under EU GSP scheme called GSP Plus and Everything But Arms (EBA) treatments. Under the Everything But Arms (EBA) treatment of EU GSP 49 Least Developed Countries receive duty-free quota-free access for all their products except arms and ammunition. GSP Plus, the hot favourite topic among Sri Lankans during the last few years was introduced by EU in 2005 under EU GSP Scheme as special incentive arrangements. The special feature of this scheme is all the eligible products under this new scheme could be exported by selected beneficiary countries to EU totally import duty zero or duty free. The beneficiary countries are able to expand their export to EU better than the scenario they enjoyed under standard GSP scheme come since 1971. Under the standard GSP the products from beneficiary countries have been imported in to EU not totally duty free, but reduction of normal import duty rates. In standard GSP, the main important factor considered by Donor countries is, if the Receiving countries respect mainly the labour rights. But in GSP plus, the beneficiary countries should mainly confirm and effectively implement 27 core international conventions on human and labour rights, good governance, etc. Since the early 1970s Sri Lanka has been enjoying the GSP benefits from donor countries. Even though the GSP facility is offered by all these donor countries, Sri Lanka is more concerned on EU and USA GSP facilities because Sri Lanka exports 57% of its total exports to these two markets. While Sri Lanka was enjoying GSP, Sri Lanka was able to become a beneficiary country under the special scheme GSP Plus introduced by EU in 2005. The special feature was the offer of benefits was limited to a few countries, only to 10 to 15 countries. It is hard to understand why high priority is given to GSP of EU in the political agenda of government, when similar trade concessions are approved by certain other countries as USA and Norway. The writer wrote an article covering the main factors to Daily FT on 1 April 2016 titled ‘Why GSP is important to Sri Lanka,’ hit by more than 22,000 through internet. The main reason is the loss of GSP Plus of EU affected the garments exports to EU. Policymakers of the Sri Lankan Government also have highlighted that the EU decision has caused a heavy blow to the export trade, especially the garment sector, with the closure of several garment factories amounting to a loss of nearly $ 800 million of exports in the last few years. Now it is clearly visible that the key player in the GSP facilities for Sri Lanka is garments. A review of Sri Lankan exports indicates that nearly 57% of its total exports are exported to EU and USA. It shows 26% of exports are shared by USA and the majority 30% is shared by EU. Out of all products exported during the last 25 years, the apparel sector has taken the lead in 45% of total products exported. The most significant feature is that USA and EU equally share 43% of the exports, making the total 86% of whole Sri Lanka apparel export. In view of the above facts, it is important to look into how the EU GSP Plus affects Sri Lanka, compared with GSP USA as the two leading export trading partners. As indicated above, the import tariff of all products categorised EU GSP are 20% less than to general import tariff, but the beneficiary country of GSP Plus of EU could export the products on duty zero. Table 2 indicates a few samples on the EU GSP import tariff structure. Special significance of the American GSP is that all products categorised under the US GSP scheme are entitled to enter the US market with duty zero facility. Even though the USA is the second largest market after EU for Sri Lanka, the benefits under USA GSP are very minimal. The main reason is that articles such as textiles, apparel, footwear, handbags, luggage, work gloves and other leather wear, ceramics, glass and steel, etc. are not included in the USA GSP list. This reveals that even apparel, Sri Lanka’s biggest export product which covers 75% total exports to USA, the buyers of USA have to import under the normal import tariff. Sri Lanka’s main products exported under USA GSP are rubber products, gloves, mittens and mitts mixed with rubber or plastic. It is obvious that Sri Lanka’s exports last year was approximately $ 300 million worth of items which covers only 10% of total exports to the USA under USA GSP facilities. This clarifies the demand for EU GSP Plus. Today the EU has become the leading business dealer of international trade with nearly Euro 4,000 billion in trade. The EU consists of 28 powerful Western nations having a population of 500 million and high purchasing power. The EU has achieved a strong position by acting together with one voice on the global stage, rather than with 28 separate trading nations. Even if Sri Lanka enjoys GSP facility with other developed counties, the EU is recognised as the major player which provides more benefits, not only from one country. On the other hand the most of Sri Lankan leading export products to EU are included among the 7,000 products eligible for EU GSP. It should be noted that all apparels categorised under HS tariff Code 61, 62, and textile code 63 except a few items are permitted for export under EU GSP facilities. Footwear, tuna, other seafood, ornamental fish, some variety of cut flowers and foliage, black tea, gherkin, rubber items, activated carbon, tableware, and wooden products among the Sri Lankan export products of supply capability are in eligible list of EU GSP. This shows that approximately 90% of Sri Lanka exports to EU are exported under GSP Plus or duty zero entry to the EU. There has been no progress in export trade as proved by the export figures during the last few years. Political leadership and the officials claim as an excuse that it was the withdrawal of GSP Plus of the EU that affected exports. But now that GSP Plus has been granted by the EU, it needs to walk the walk and not talk the talk. Brexit is a subject that requires thoughtful discussions. The decision of the UK to quit the EU could create another unfavourable situation for Sri Lankan export trade. The UK has been at the apex in trade as Sri Lanka’s export destination and continues to maintain its cooperation with the colonial connection it had with Sri Lanka. In a few decades the UK has become the second highest export destination with $ 1045 million in 2016 after SL exports to USA $ 2,809 million. As far as export product wise to the EU is concerned the UK is a major player in most product sectors. Approximately half of the apparel exports to the EU are shared by the UK. Today Sri Lanka exports more than 40 products to the EU with significant quantities and it mainly goes to the UK. 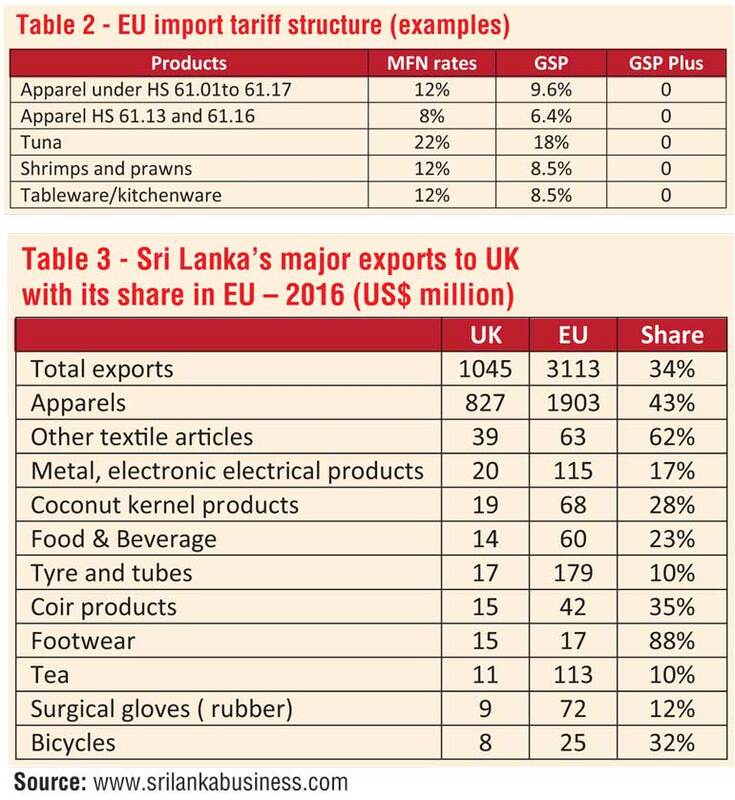 With the exit of the UK from the EU, Sri Lanka may lose the tariff concessions under GSP and GSP Plus for the bulk of its products to the Western market and have to compete with other suppliers from the entire world. The same result would be affected for other competitors. On the other hand, Sri Lankan exports to the UK for the last 40 years were effected under common rules and regulations stipulated by the EU. As a member of a custom union, the UK offered a common tariff that was approved by EU. It is too early to predict what kind of tariff structure will be introduced by the UK as a non-member of the EU for future trade. There is every possibility that the UK will introduce a preferential tariff system or GSP as an individual country because almost all Western countries operate schemes of similar status but nobody can predict what will be the final choice of the UK. The significant factor is that these issues need deep consideration of the future. Sri Lanka is confronting a very difficult situation due to stagnation of its exports to $ 10 billion in the last eight years. Brexit, decline of USA GSP, and new political and economic trends in developed countries have made the situation more difficult as it appears. In addition, more than 60% of exports depend on Sri Lanka exports to the USA and EU and it will take a long time to find new markets around the globe even though there is hope that it may be possible in the near future. What is more important is to consider a short-term strategy than long-term. Sri Lanka should take immediate measures to initiate negotiations on a Free Trade Agreement with the UK. Mostly it has been the practice in Sri Lanka to have negotiations mainly with Asian countries, doubtful of profitable gains. Obviously, Sri Lanka could easily initiate a favourable trade agreement with the present trend of trade with the UK. It displays the trade balance between Sri Lanka and the UK is continuously operated in favour of Sri Lanka; against $ 500 million imports from the UK, Sri Lanka exports $ 1,044 m to the UK. As the writer proposed in his article ‘Brexit and Sri Lanka Exports’ published in 2016, it would be the appropriate time for the United Kingdom, Canada, Australia and New Zealand as members of the Commonwealth to introduce a common preferential tariff system to its developing member nations. As the key member of the Commonwealth it is a bounden duty of the UK to protect the interests of its member nations in development of trade and economy without keeping this institution as a ruin of its former empire. Sri Lanka could take the leadership on basic negotiations for a Commonwealth preferential tariff system. Canada presently operates a preferential tariff system called Commonwealth Caribbean Countries Tariff (CCCT) to offer tariff concessions to agricultural products of Commonwealth Caribbean countries. 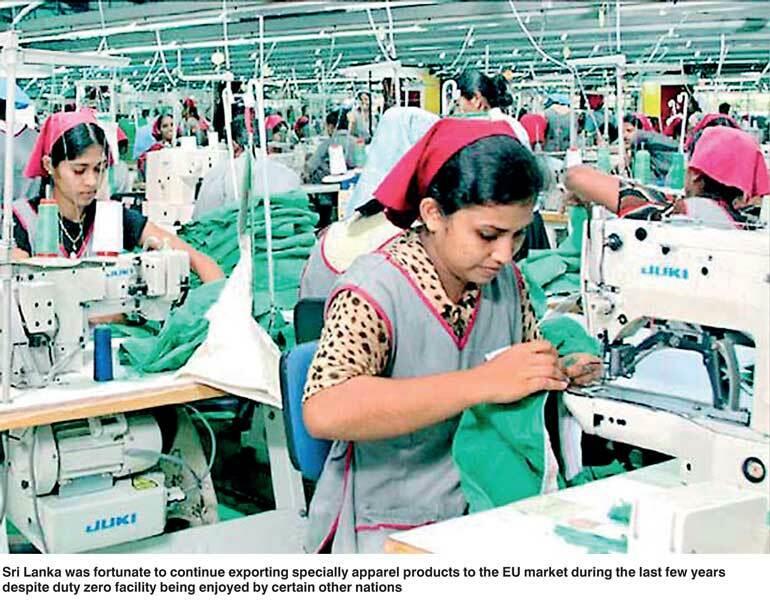 Sri Lanka was fortunate to continue exporting specially apparel products to the EU market during the last few years despite duty zero facility being enjoyed by certain other nations. Continuation of supply of Sri Lankan products to upper and upper middle class market segments with high value and continuous value addition resulted a commanding success of business. This success was mainly due to the strategic approach of the business community. In view of the current global tendency, it appears that the developing nations cannot further depend on preferential treatments from the exterior. They should strive to stand on their own in high respect with manufacture of high quality products in an attempt to excel the world standard. There is a National Advisory Committee of Exporters set up by SLEDB in line up with EDB Act. This is the correct time to reactivate this advisory committee. The immediate attention of the President or Prime Minister is requested to have a forum with business community to reach an appropriate strategy in an attempt to face new challenges. South Korea followed this nature of step in the early 1980s. China and Vietnam as Communist countries are ahead in reaching their economic goals because they adopt better strategies to meet global needs rather than countries that carry market-oriented economic policies. They encourage the business community to experiment with new methods and technologies and not to depend on one market or one product but to diversify production and markets. Furthermore, assistance in maximum strength is extended to establish the national brand worldwide rather than promotion of single products.